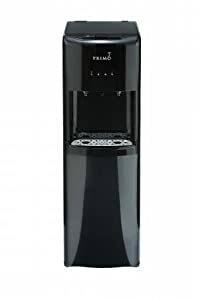 Based on thousands of online reviews, this is our top choice for the best Bottom Loading Water Dispenser on the market. Dependable and easy to use, this model can provide years of hot and cold water on demand. Self cleaning technology! Build by Whirlpool, an industry leader in appliances. Before we get into our top 5 selections, let’s talk about the different types and benefits of a bottom loading water dispenser! If you’ve ever personally loaded a water jug on a traditional water cooler, you’ll know it’s not the easiest task. Those jugs are heavy, and one slip up could mean spilling water all over the floor! That’s where bottom loading water coolers come in, and they work exactly like they sound. No more lifting heavy jugs, just slide the jug in the compartment and you’re off to the races. We have selected the top 5 best bottom loading water dispensers on the market, and all you have to do is read our review to find out the pros and cons for each. Afterwards, you can convince your office manager to select the perfect one for your office. Water cooler talk is sure to change in your office thanks to your hard work and dedication. Heating & Cooler dispensers – You have the option of having hot and cold water. You don’t need to lift 3-5-gallon water bottles that weight 25-45 lbs.! Finally! A self-cleaning water dispenser. The others have been dishwasher safe, but this one is self-cleaning. This is due to its 6th sense technology and then it uses unstable oxygen in order to kill bacteria and other viruses that can be contaminating your water. It is nice and sleek for your office since it is made of stainless steel. And it even has a nickel planted front and sides for a sleek and sophisticated edgy design. Look wise, this to me is the most aesthetically pleasing to the eye. It screams sophistication and luxury, but the price tag does not. This is by Primo Water. It is sleek and black standing about 41 inches high. You are able to bottom load and save your back from aches and pains. This is our lightest water dispenser weighing in at only 16 pounds. Most weigh between 40 and 45 pounds. It is able to work with different brand of water bottles and not just Primo. You can use Poland Springs, Deer Park or whatever other brand your heart desires. Zero complaints about the cold water temperature. Not freezing cold, but not room temperature. Seems to be just right. Many report leaking issues which seems to be quite common with this brand of water dispensers. The name says it all. This is one of the best bottom loading water dispensers available. It is sleek and modern with its black and chrome accents. It will fit into any home or office easily. You have three water temperatures to choose from: hot, cold and room. This way you can choose whichever you’d like. What I like about this model is that it has a built in night light so when you need a glass of water in the middle of the night, you do not need to turn a light switch on and hurt your eyes. You can see the taps just fine. You also have the child proof lock so they are not able to dispense hot water. Let’s take a look at some other pros. This water dispenser is not as aesthetically pleasing. It is just a clean white water dispenser. No chrome or stainless steel features. The only stainless steel is the water tank which provides the clean drinking water. I would say it fits better in with a home than an office, but that is just my opinion. This water dispenser is a bit shorter standing in at 40 inches high. In order to dispense the water all you need to do is push in the tap. Do not worry about spills as there is a drip tray that can be taken out. Also there is a child lock to prevent kids using the steamy hot water. One of my favourite bottom loading water dispensers. You can have your hot cup of tea at breakfast or soup for lunch, cold refreshing water for your reusable water bottle, or just water at room temperature for whenever you want it. Isn’t it nice having more than one option when it comes to your water temperature? You will also be happy to learn that even though the water jug is hidden, you will always know when to replace it when its indicator light flashes. Go ahead, read some of the pros. Suction can become loose if water jug not replaced correctly. 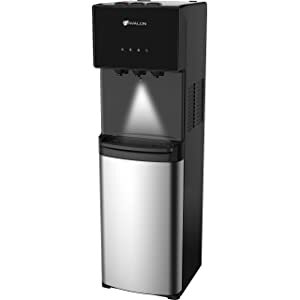 Our choice for best bottom loading water dispenser is the Whirlpool self-cleaning water dispenser. We love its sleek nickel and stainless steel exterior and the temperatures it is able to dispense the water at. You can make a hot cup of tea, or enjoy an iced tea on the go. 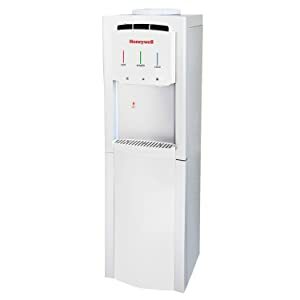 What is most ideal about this particular water dispenser is that it is designed for commercial use, but it is still able to be used at a residential setting. You do not need to worry about cleaning it either since it is self-cleaning. No bacteria or viruses to be spread through the water valves and pipes. Just clean water for the whole family and office. I know I would rather trust a company that has been making bottom loading water dispensers for years, possibly even decades longer than others. They have the engineering done for that and are now improving other features making them top of the line in water dispensers. If I had to pick a runner up for the best bottom loading water dispenser I would have to say Avalon Bottom Loading Water Dispenser since it offers 3 different water temperatures. You can have the freezing cold water and the boiling hot water, but you can also have the room temperature water which is not offered on the Whirlpool water dispenser. It also helps that it has a child proof lock on it so your children will not pour boiling hot water on themselves. So next time you see your office manager, casually mention the Whirlpool self-cleaning water dispenser. It’s stainless steel and nickel which will blend in with the office kitchens and break rooms flawlessly. These are sturdy, reliable models that you can use for years to come. 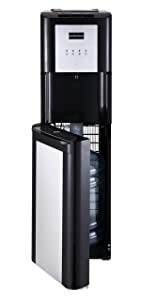 And don’t forget to pair your new water cooler with a stylish glass water bottle or even a filtered water bottle.